The agony of choosing mulch! I hope you’ll enjoy this article and that it helps answer some questions that you may have. Enriching your soil (especially in this part of Wisconsin where we endure clay) is a marvelous outcome of using natural mulch and well worth the investment in time and money. 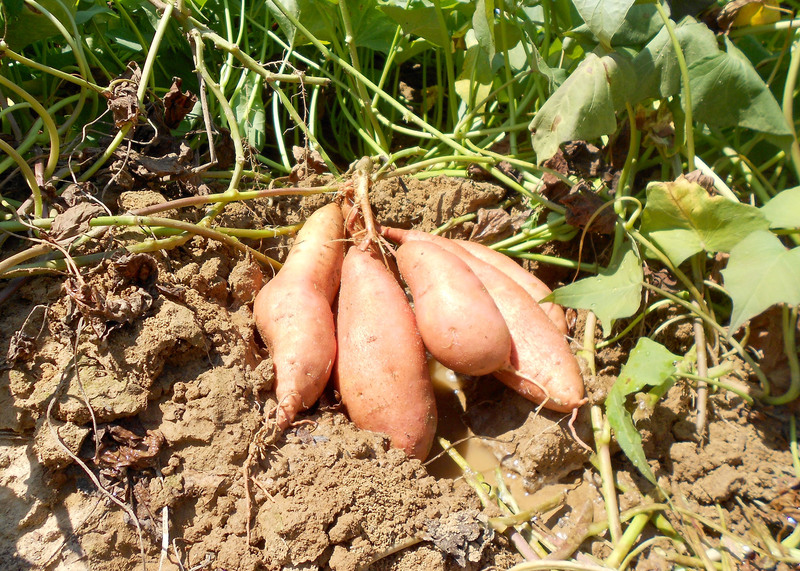 The sweet potato (Ipomea batata) is a delicious, nutritious, and high-yielding vegetable crop. Prepared as pies, fries, or in African stew, this “super food” is high in fiber, vitamins A and C, and low in fat. Some varieties are grown ornamentally in containers or hanging planters and produce smaller roots not used for consumption. 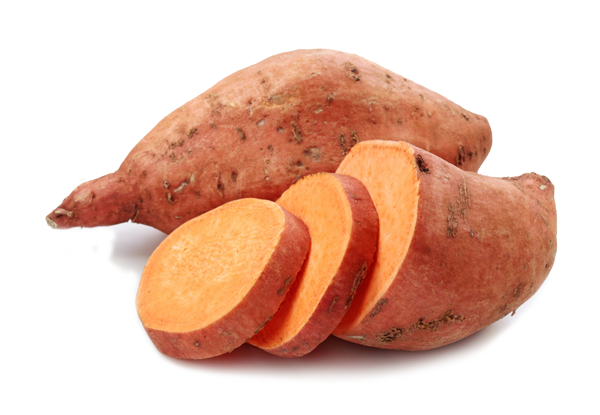 Not be confused with the yam, the sweet potato is orange in color and native to the Latin American region. The true yam (Dioscorea sp.) is unrelated genetically, less nutritious, white or yellow in color, and native to the Asian and African regions. Sweet potatoes are propagated vegetatively rather than by seed. Old potato seed is used to grow slips, or transplants. Slips can be purchased, but it may be more economical to sprout your own slips. Do not plant until early June until all risk of even light frost has passed. Remember that the slips are very fragile because they rely on establishing new root systems rather than obtaining nutrients directly from the tuber like the standard potato. Do not store slips in water before planting. The photo to right shows slips that have prematurely sprouted roots and are weakened having spent precious energy before being planted. Keep the slips in a warm, dry space for no more than 5-7 days before planting. Each node will sprout a sweet potato. Remove leaves from the nodes except for 1-2 at the upper-most growth point (meristem). Be sure to plant the slip vertically in the ground with all leafless nodes buried. Remember that each node will sprout a sweet potato so planting less nodes will yield larger, less numerous sweet potatoes. It is very important to give your plant the proper spacing. A member of the morning glory family, the sweet potato will spread for many feet. Slips should be planted at least 12 inches apart with at least 24 inches between rows. If you are planted in raised beds, give each plant at least 4 square feet. More space is optimal. If your space is limited, consider vertically trellising the vines. Your slips will wilt from transplant shock. Water for several days after planting and they will recuperate as the roots establish. After initial planting, sweet potatoes will need 2 inches of water weekly, twice the average vegetable plant. Proper mulching with improve water retention, keep competing weeds down, and increase soil temperature. Thickly spread marsh hay or grass-clipping or use black plastic sheet mulch (biodegradable is best). To harvest, dig the main crop of sweet potatoes before or directly after the first “hard” night frost (below 32 degrees) in the fall. Most varieties need 90-100 days to grow, so most Wisconsin grower leave the roots in the ground to mature until first frosts in October. To harvest, remove the top growth by snipping the stem at the base of the plant. Dig 1-2 feet around the sweet potato cluster with care not to damage the roots as you dig. Use a spading fork or stout shovel and be careful not to bruise, cut, or otherwise damage the roots. Dig below the level of the ridge and gradually move closer toward the plants, removing soil until the fat roots are exposed. Sweet potatoes should be handled as little as possible to avoid damage. To clean off stuck-on soil, lightly spray with them water and try to avoid rubbing. For best quality, use the potatoes as soon as possible after they have been stored. If you are would like store them overwinter, you will need to allow them to cure. Curing them in a warm, humid space (85 degrees; 90 percent humidity) such as a porch or garage. After 1-2 weeks, the starches will convert to sugars and thicken the skin for longer storage and will make the potato sweeter. Good luck growing! Honey bees are not native to the Americas; they were introduced from Europe in the early 1600’s for honey production. 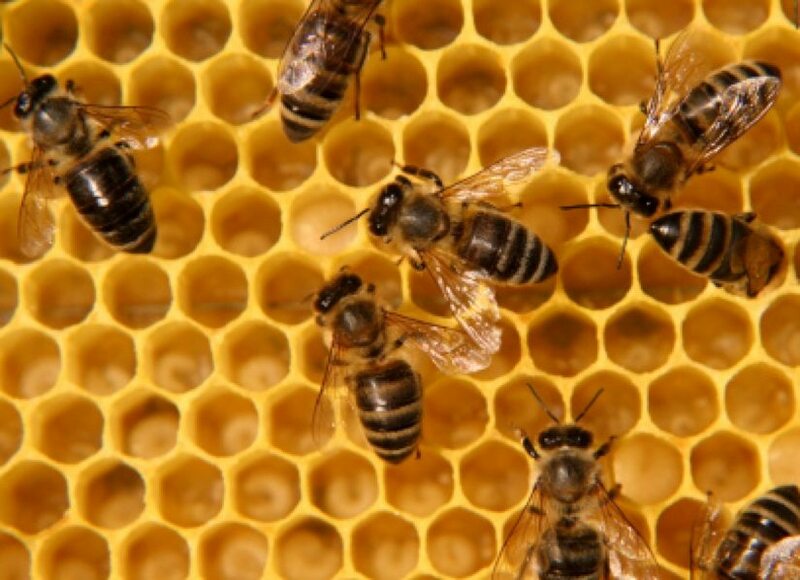 Honey bees are thought to have originated in Asia and expanded to North Africa and Europe. There are two species that are considered to be suitable for apiculture. In recent year there has been concern over “colony collapse” and the risk of not having enough pollinators for our agricultural industry. A hedge against this possibility is to encourage proliferation of native bees. The DNR has published a very good article on what an individual can do http://dnr.wi.gov/wnrmag/2009/06/bees.htm#2 . This year the Outagamie County Master Gardeners will be installing various types of bee houses on the grounds of the Outagamie County Agricultural Extension. I just finished reading this book and I know what you’re thinking. Too many rainy days, must have had trouble sleeping. But you’re wrong; this book is riveting as plant books go. I think you’ll gain new respect for ferns if you didn’t appreciate the wonders of a spore reproducing plant that dates back 340 million years. The book’s 33 chapters (any one of which could be a stand alone) is organized under six major headings: Life Cycle, Classification, Fern Fossils, Adaptations, Geography, and Ferns and People. You’ll be glad to know that the glossary is clear and will cause you to be a real page turner if you want to enhance your knowledge of ferns or be botanically correct. Here is the author’s crystallized version of how enriching fern study can be. 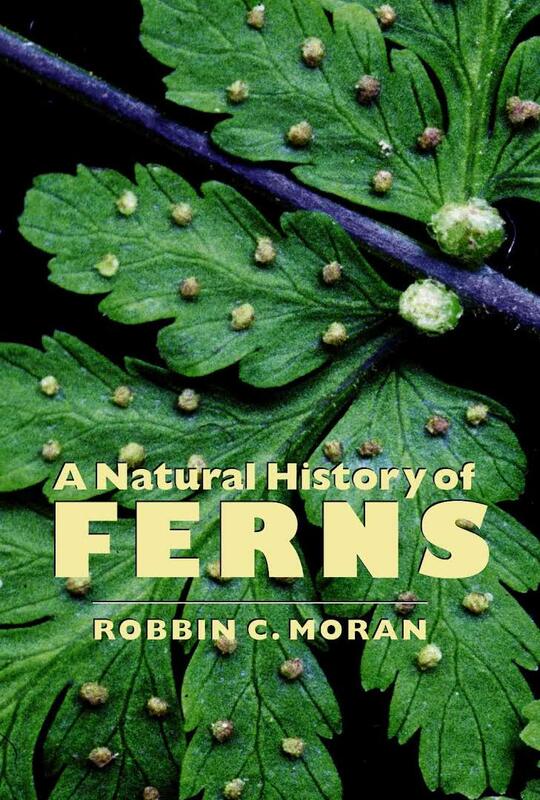 “Learning the meanings of names of ferns opens a little window that looks out onto pteridology, the study of ferns. Through it you can glimpse people who developed the science, the voyages that brought back to Europe many previously unknown and marvelous species and the ancient cultures and what they believed about plants. The book has the best explanation I’ve seen of the advantage of using the Latin binomial for plant reference and ex- plains how the process of naming works. To name a “new” plant with a new Latin name, you need to comply with five requirements prescribed by the International Code of Binomial nomenclature. The code evolved over the years and every six years, an International Botanical Congress revises it. You don’t need to have a PhD in botany or membership in a scientific society to name a new species. Anyone can do it as long as they present evidence that the plant differs from any previously discovered and as long as they follow the rules. Between 1991 and 1995, about 620 new kinds of ferns were described worldwide, mostly in the tropics. You’ll enjoy the chapter “At the Movies” as it relates to a movie “A New Leaf” released in 1971. The plot centers on the naming of a new fern. We shouldn’t be surprised that ferns could be invasive. One such purple loosestrife like species is the salvinia mo- lesta. It’s capable of doubling its population in size in just two days. This weedy one clogged irrigation ditches, blocked drainage canals and jammed water pumps. In some places, it harbored the human blood of parasite schis- tosomiasis causing entire villages in the Asian tropics to be abandoned. The story of finding the natural predator for this species is like a CSI. In contrast, the most economically beneficial ad smallest fern in the world is the Azolla. In North America, it grows in the Mississippi River floodplain of northeastern Arkansas. In Southeast Asia, especially China and Vietnam, it’s a rich nitrogen fertilizer for rice paddies. Nitrogen is release as it decomposes. Because of Azolla, the rice grain is richer in protein than if fertilized with chemical fertilizer. You’ll enjoy the cultural and economic discussion surrounding this tiny fern. Pteridomania is the most engaging chapter under the “Ferns and People” section as well. If you enjoyed botany at any point in your life, you’ll love this book. If you didn’t, you’ll find the author’s conversational styles slyly teaches you a lot. Yes, there are pictures; several pages of colored plates and lots of enlightening drawings, many of them done by the author. I have a whole new respect for the Osmunda claytoniana (interrupted fern) that I just got from Wild Ones. It has a longer fossil record than any other fern, extending back 200 million years. I found my hardcover of A Natural History of Ferns at the Menasha Public Library. It’s still raining (the ferns love it) and my eyes are getting a little heavy but I know it’s not the book! The process of worm compost is interestingly different from the regular composting procedure. Worm composting or vermiculture is an easy, affordable, and low-maintenance way of creating compost. It has a lot of advantages. Definitely it requires less work, just let the worms eat up all your scraps and in two months you’ll have rich compost at your disposal. The worms used in composting are the brown-nose worms or redworms. They work best in containers and on moistened bedding. Those night crawlers or large, soil-burrowing worms are not good for composting purposes. Just stick with the redworms and things will work out well. All you need to do is add food waste to the container and soon enough the worms will eat them up and convert compost together with the bedding. Before placing your redworms inside containers, place a nice layer of paper to serve as bedding for the worms. Any kind of paper will do, but it has been observed that the worms will consume newspapers, cardboards, paper towels and other coarse papers faster. The worms will eat this layer of bedding together with the scraps of food to convert them in compost. You can also add a bit of soil on top of the paper and a few pieces of leaves. If your redworm container is located outside the house, try considering adding livestock manure on it. Redworms love them. Fruits, grain, or vegetables are great for worm composting. The redworms can even eat egg shells, coffee grounds, and even tea bags. Avoid giving them meat, fish, oil, and other animal products. Like the traditional composting, these materials only attract pests to the composting bin and also produce bad smell. The proportion of worms to food scraps will be based on how much scrap you like to be composted in a week. For example, if you want one pound of food scrap to be composted a week, all you need is also a pound of redworms. You don’t need to add redworms into the container unless you want to increase the amount of food scraps you intend to compost in a weekly basis. For containers, keep it well ventilated to let the air in and let the excess moisture out. 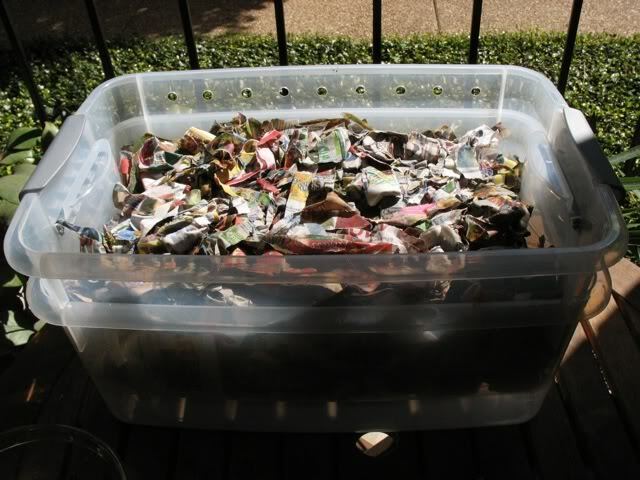 You can use plastic bins, and even wooden boxes for worm composting. The time to harvest would be when the container is full. Scoop out the undigested food scraps as well as the worms which are usually on the top few inches of the material. The remaining material inside the container is your compost. To remove the remaining worms from compost, you can spread the compost under the sunlight. Forsythia is one of the harbingers of spring. The bright yellow blooms indicate that spring has finally sprung! Forsythia’s bloom coincides roughly with soil temperatures at 55F at 1/2 inch depth — the conditions crabgrass seeds need to germinate. So, when forsythia blooms, it is time to apply pre-emergent crabgrass products. The key to a pre-emergent is to apply and water in before crabgrass seeds germinate, but not too far before, because many products available to homeowners have a limited window of efficacy, usually about 90 days. Products available to professional lawn care companies have a longer period of efficacy, so you often see companies applying these products earlier than when the forsythia blooms. Pre-emergents don’t actually kill the seed; they create a chemical barrier that doesn’t allow seeds to germinate. If the soil is disturbed and the barrier disrupted, germination may still occur. One problem with pre-emergents is that they will also prevent desirable lawn grass seed from germinating, if it is sown while the herbicide is still active. So, be careful when and where you apply the pre-emergent and where you seed later. If you have dead patches of lawn in spring and want to reseed there, avoid using a pre-emergent in that area. The best time to sow lawn grass seed is actually late August or early September, but if you need to seed in spring, just make sure to keep the seed watered, if it is a dry spring (the same, if it is a dry fall). Wait until the seed has germinated and is about 2 inches tall before fertilizing. The lawn, in general, should not be fertilized until Memorial Day. Crabgrass is one of the most common weed problems in lawns. Its gets its name because the leaves form a crab-shaped design. Crabgrass seems to appear in close-mowed lawns and bare spots and in the fall it turns a brownish red color. Seed heads show up in the summer and fall and stems will continue to spread unless they are stopped. The best prevention is dense, healthy, thick turf, which prevents it from invading because crabgrass seeds need light to germinate. However if you haven’t had that success with your lawn, you may need to go on the offensive by treating your lawn with a preemergent herbicide in the spring, to prevent the crabgrass from germinating and spreading You will want to do this in mid to late April when the ground temperature is about 52 degrees. To check the ground temperature in this area, you can reference www.greencastonine.com. Click on Agronomic Tools, Soil Temperature Maps. You’ll see the date in the upper left corner. Click on Wisconsin, and zoom in to see the temperatures. If you don’t get your preemergent down before the warm temperatures are here, you’ll need to wait until next spring. FYI…One crabgrass plant is capable of giving off 100,000 crabgrass seeds. All the more reason to get rid of this weed.